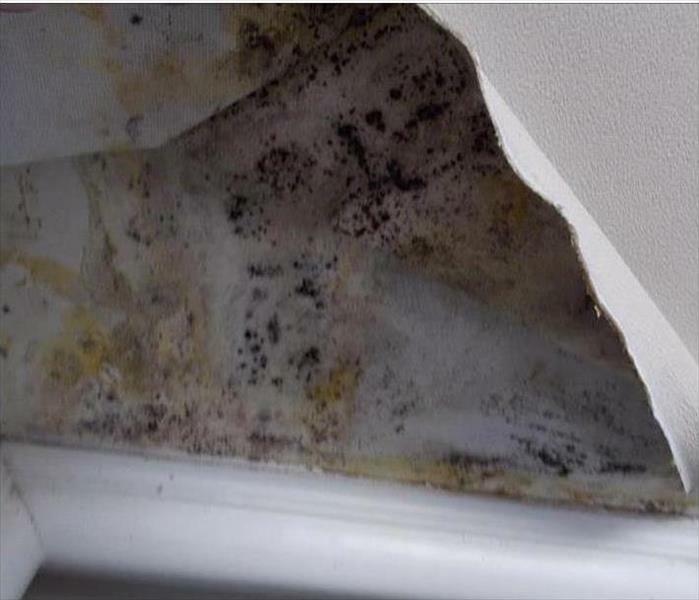 When the roof leaked in this Bloomingdale area home, the water stains are indicating a professional service is needed. 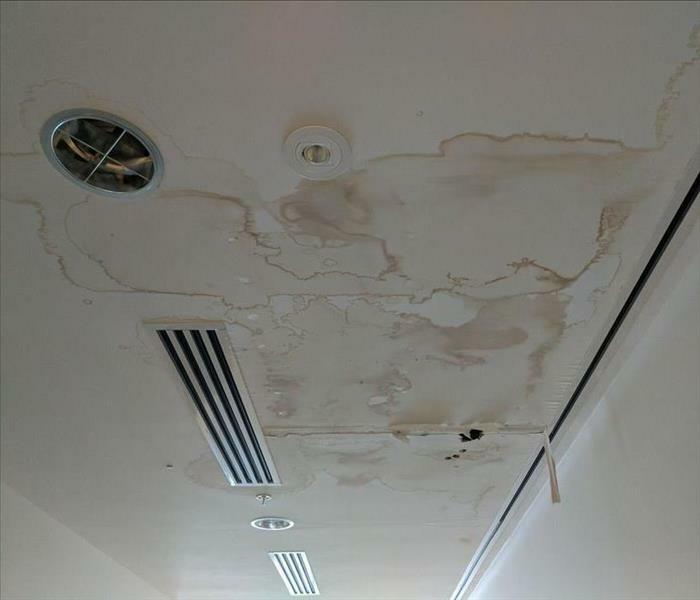 If SERVPRO gets the call, we have the skilled technicians to assess, measure the moisture levels and extent of the water damage to establish a baseline to attain drying goals, and then proceed with the controlled demolition of the non-salvageable ceiling and wall materials. 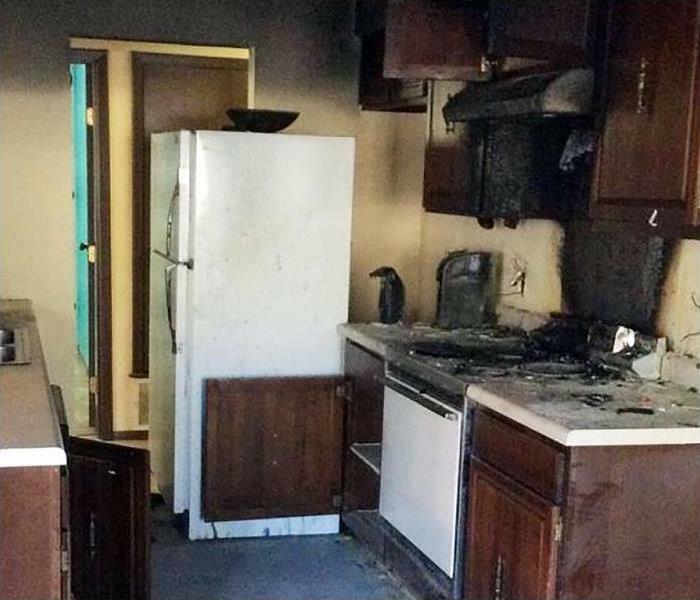 Fire damage was suffered at this Bloomingdale house. 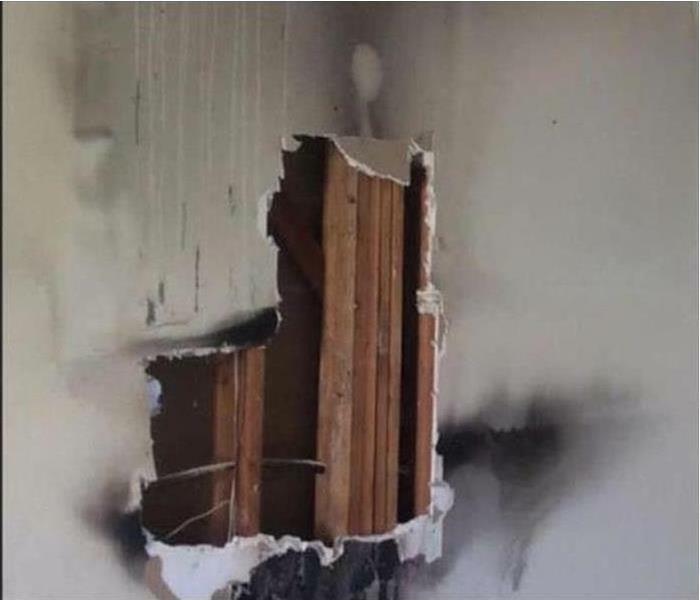 The small fire left burned drywall and soot and smoke damage as well as the telltale odor that fires leave behind. 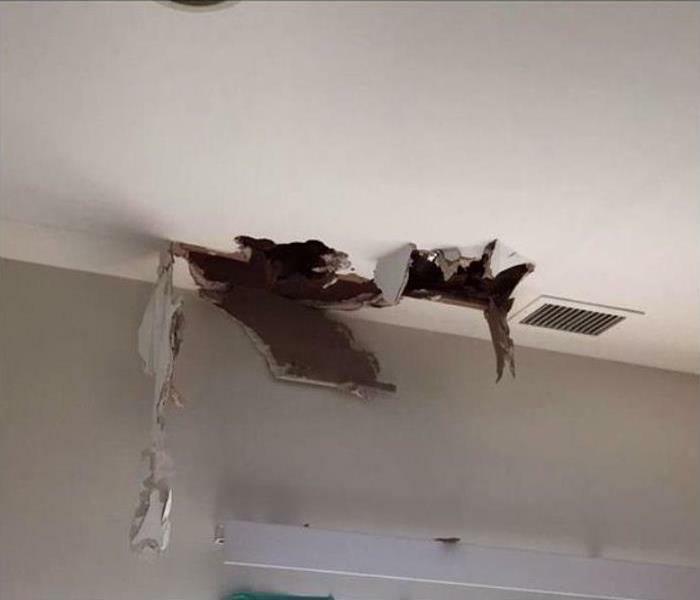 SERVPRO of Carol Stream / East Bloomingdale can remove the damaged drywall and wipe down the remainder of the affected area. We would also take steps to return the air quality to normal eliminating the odor from the fire. Our team at SERVPRO responds quickly to your storm damage emergency. Our technicians have the state-of-the-art equipment, training, and experience to restore your home to pre-storm condition. SERVPRO of Carol Stream / East Bloomingdale is ready 24/7, locally owned and operated, and Faster to Any Size Disaster. 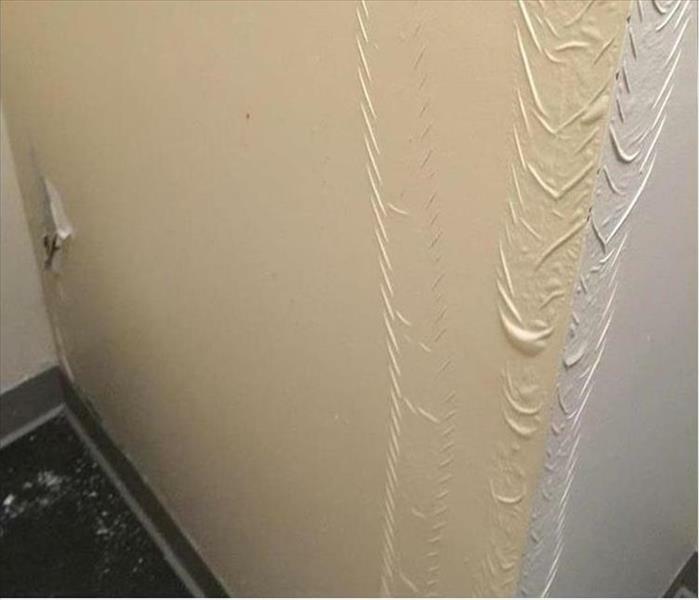 The Glendale Heights area can be affected by leaks (note the rippling of the latex paint on the wall) ruining the sheetrock and allowing mold to develop. 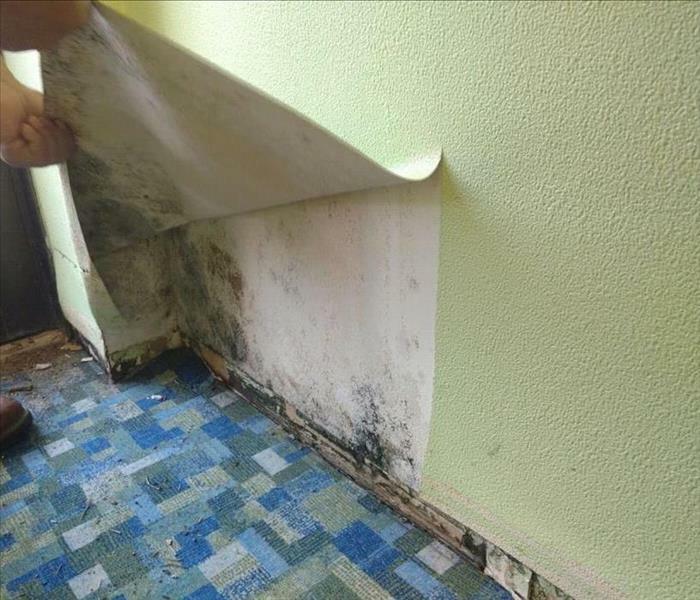 SERVPRO suggests hiring a mold remediation company to remove the non-salvageable building materials safely and to apply an antifungal product to help inhibit future infestations. The team at SERVPRO of Carol Stream / East Bloomingdale has the experience and equipment to restore your home to pre-damage condition. We have the advanced training to handle any size disaster. SERVPRO is available 24/7 and Faster to Any Size Disaster! When leaks occur in the back storage rooms of small commercial enterprises in the Carol Stream vicinity, a wise move is to call SERVPRO. We can respond quickly and set up industry-leading drying equipment to protect your inventory and your doors open for business. Strong winds can lift and damage a roof in the Glendale Heights area. 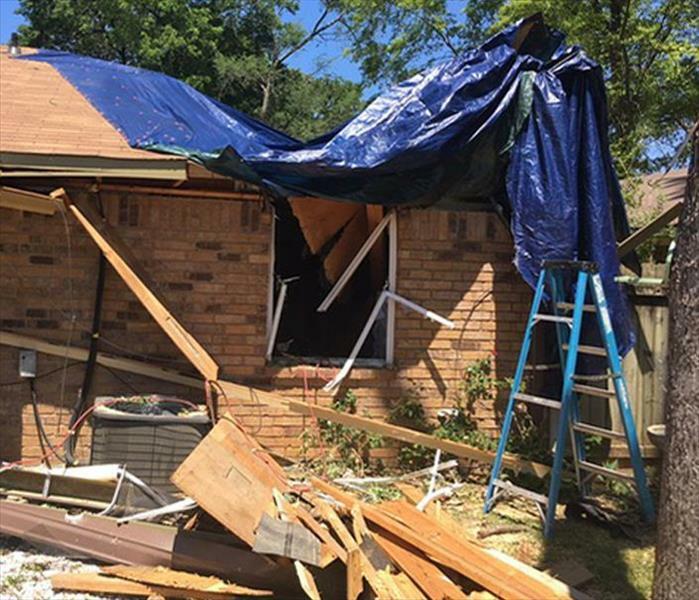 SERVPRO, when called in for the cleanup can quickly start to remove the debris and can place blue tarps to protect the damaged building from further harm temporarily. Our customer can then select a general contractor to repair and reconstruction the storm-damaged building elements. Mold can cause problems in your home, and you need help from a professional restoration company like SERVPRO. Since we are locally owned and accessible 24/7 we can arrive at your home quickly. SERVPRO of Carol Stream / East Bloomingdale has the equipment, personnel, and mold damage experience needed to restore your home to pre-damage condition. The muddy debris is still visible on the tile of this commercial building in Carol Stream. The overhead conduit is part of a large dehumidifying system in place to extract as much moisture as possible to prevent secondary water damage. 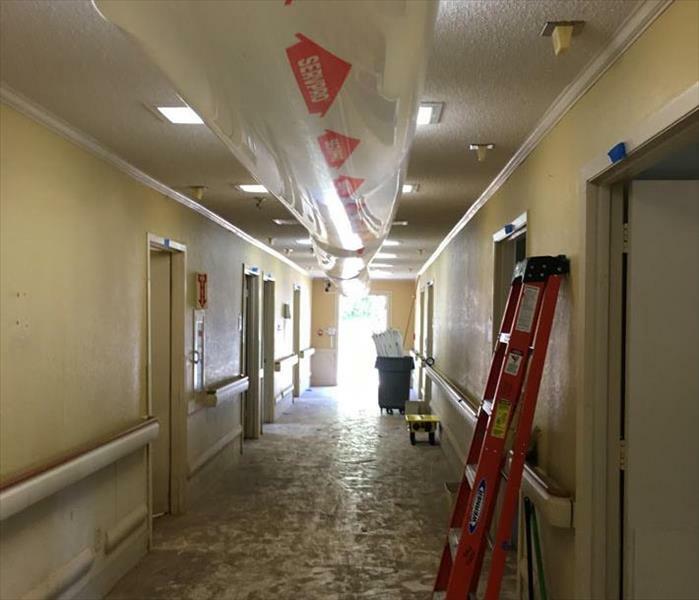 SERVPRO techs are multi-tasking to get this corridor back in service as soon as feasible. 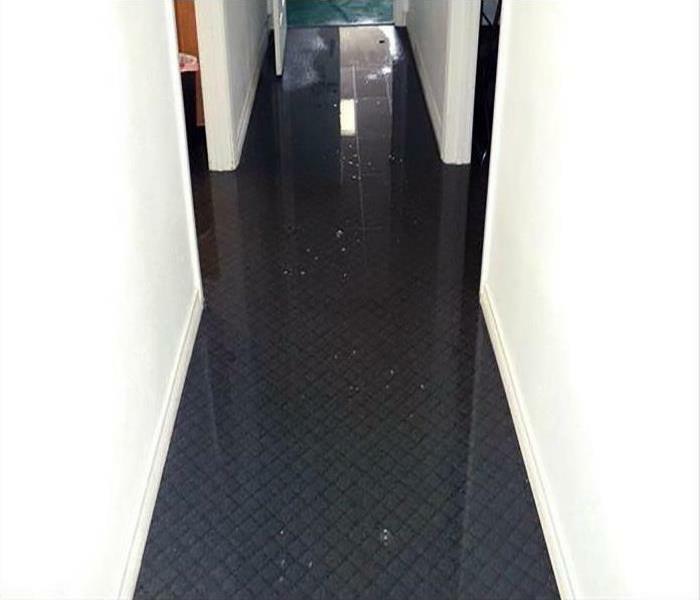 Having your hallway flooded by a storm can cause major damage within minutes. Our team is available 24/7, and we are ready to tackle any size disaster. We have the storm damage training, specialized equipment, and storm damage experience to restore your home to pre-damage condition. 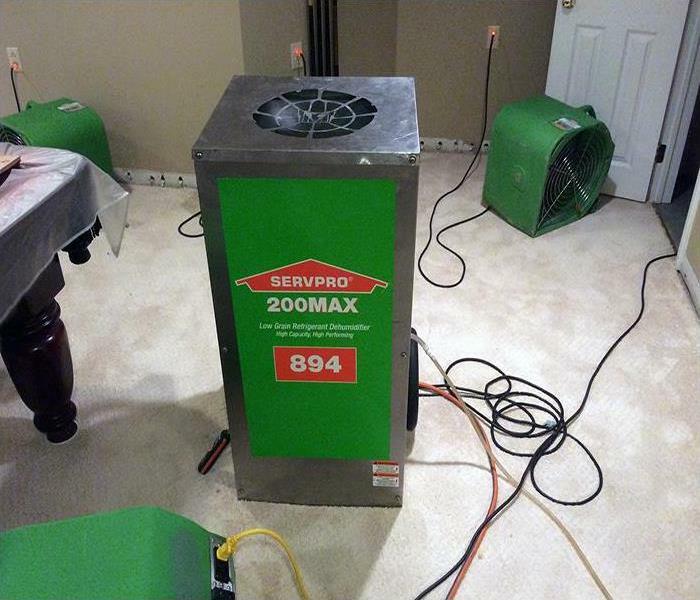 SERVPRO of Carol Stream / East Bloomingdale is Faster to Any Size Disaster! 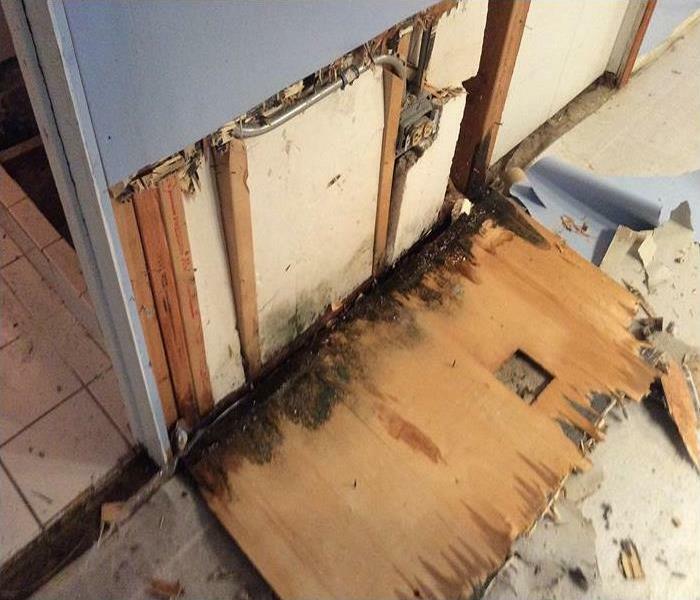 Water damage at this Bloomingdale house began in the bathroom and spread to an adjoining closet. There was damage to the flooring, drywall and the subfloor beneath the tile in the bathroom. The owner did not know how much damage there was that he could not see, so he sought out professional help. 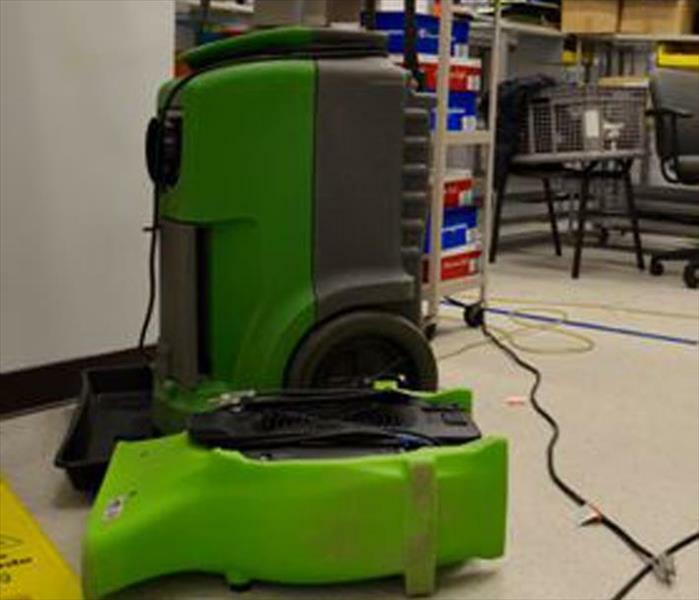 SERVPRO of Carol Stream / East Bloomingdale would remove the damaged flooring and set up commercial air movers and dehumidifiers to help dry the damaged flooring and drywall. We would use moisture detection meters to uncover any hidden pockets of moisture and make sure they were dried. Finally, we would treat the entire area with an antifungal substance to inhibit mold growth. Roof leaks allow water to trickle down through the attic supporting structure and collect in the sheetrock ceiling material. 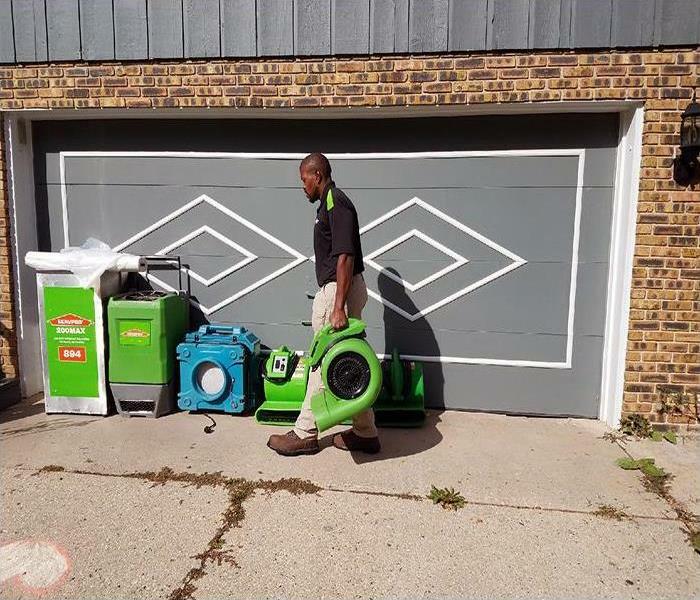 When Carol Stream companies seek a fast, water and debris removal solution to keep the business operational, they often turn to SERVPRO for 24/7 assistance. 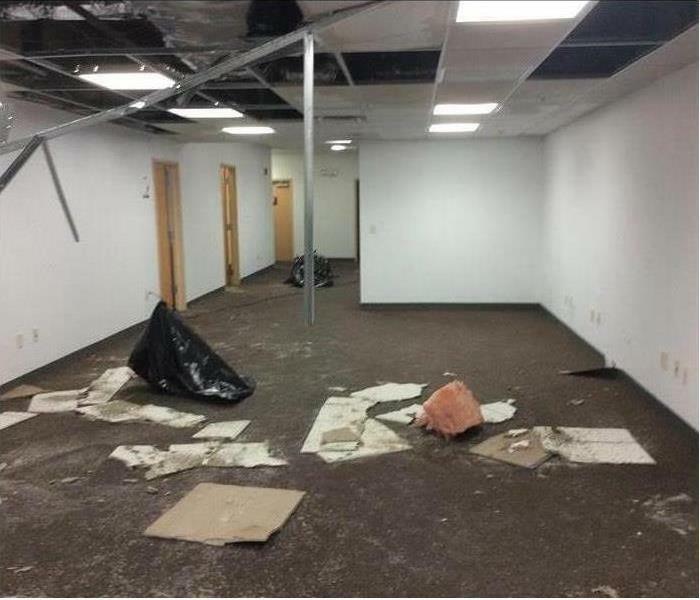 Storm damage struck this Bloomingdale office building when a severe thunderstorm with high sustained winds tore off a portion of the roof. The storm damage left them in need of tarps on their roof to prevent further damage and some serious water damage cleanup on the interior of the office space. SERVPRO of Carol Stream / East Bloomingdale is well equipped to handle all the damage to this property. 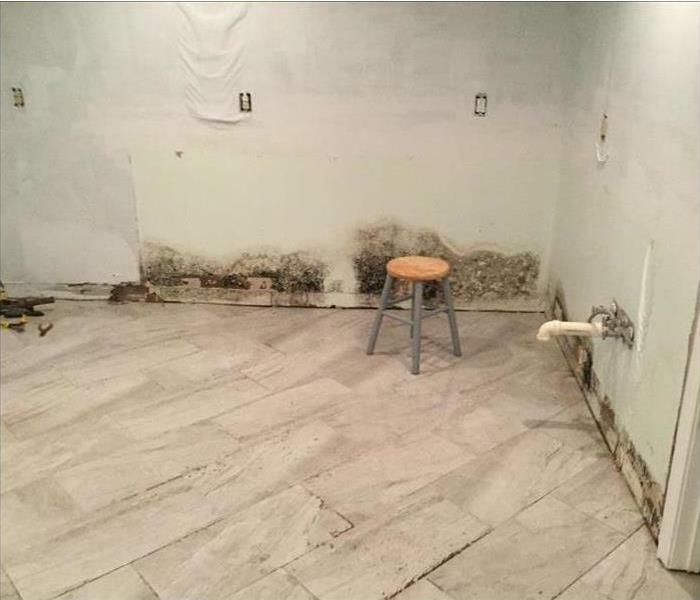 Moisture from rainwater seeping into the house and wicking into the baseboards and walls offer the perfect storm for mold proliferation. The damage can be rectified by our SERVPRO AMRT applied microbial remediation technician so that it appears "Like it never even happened." Fire damage like that depicted here does occur in Carol Stream. 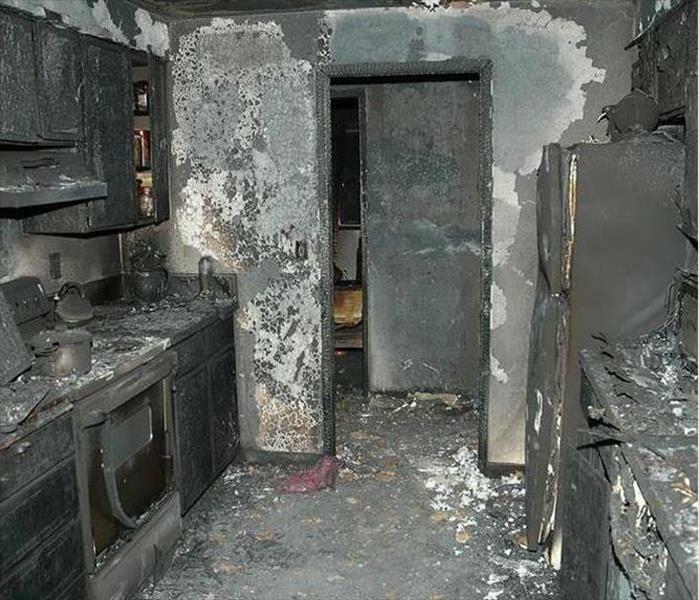 Now is the time to reach out to SERVPRO to clean up the mess and securely remove all charred debris from the premises. Smoke abatement can follow by placing ozone machines when the property is vacated for the night. SERVPRO can help mitigate storm damage from water in the Carol Stream area when called upon immediately. Time is of the essence to limit the damage to structural materials and belongs. Our Green Fleet can provide plenty of equipment manned by expert technicians to restore a preloss condition to your property. 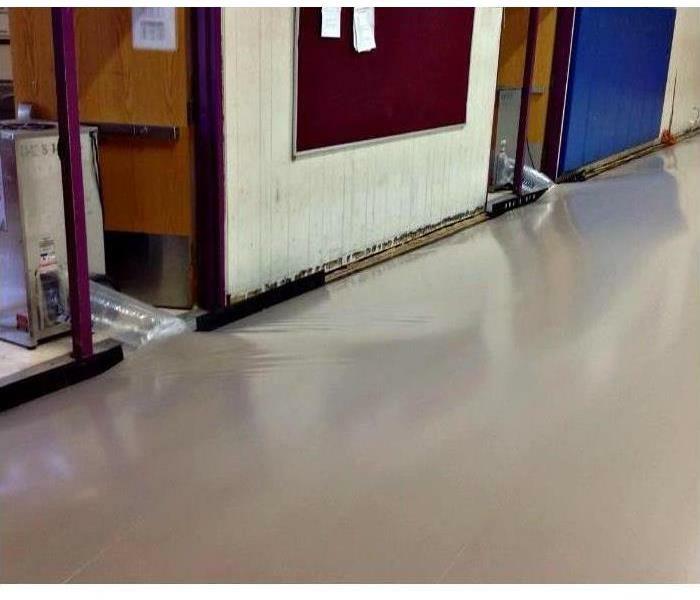 Commercial water damage in West Chicago can involve some very large buildings requiring specialized industrial equipment to remediate the damages. It also requires a company with large loss experience and the available equipment to handle the job at hand. 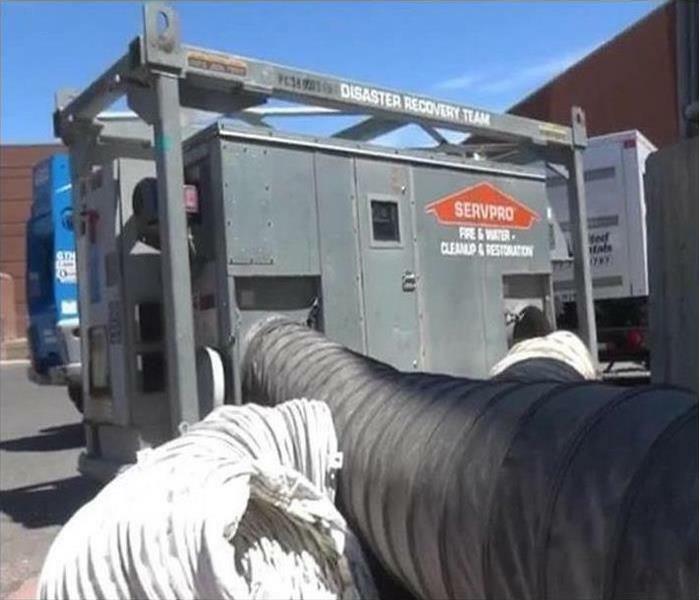 Shown here is a trailer mounted desiccant dehumidifier which is used to extract vast quantities of water vapor from water damaged structures. This boarded-up structure in Lombard needs extensive demolition, cleanup, odor removal, and rebuild for complete rehabilitation. Rely on SERVPRO to secure the property and bring in a large crew to prepare the fire-damage house for the rebuild. 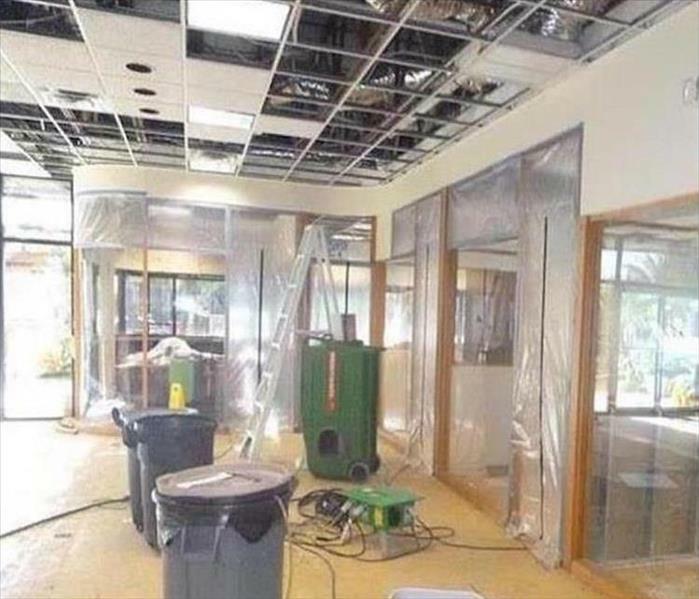 This commercial building in West Chicago was closed down after the storm ripped a hole in the roof and flooded the drop ceiling and walls with water. 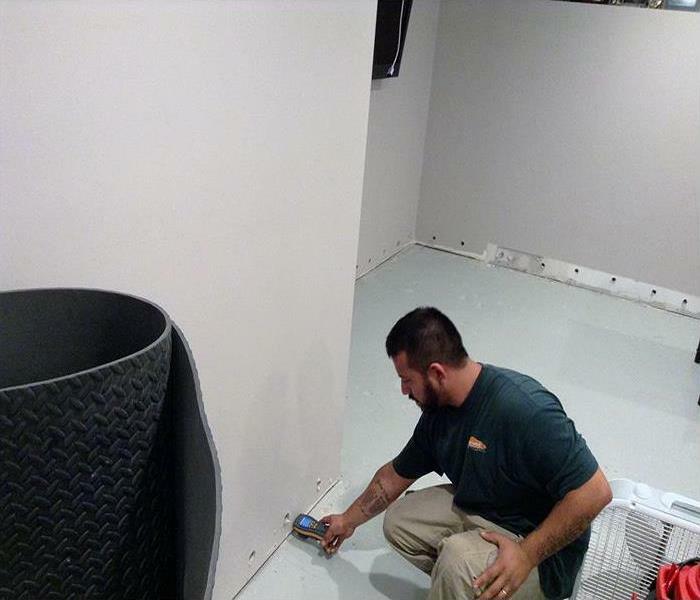 SERVPRO can set up containment barriers to isolate areas to expedite the drying with the use of heavy duty LGR dehumidifiers and air movers. Fire damage at Carol Stream homes or businesses can leave behind nasty smoke odors from a fire that has been extinguished. 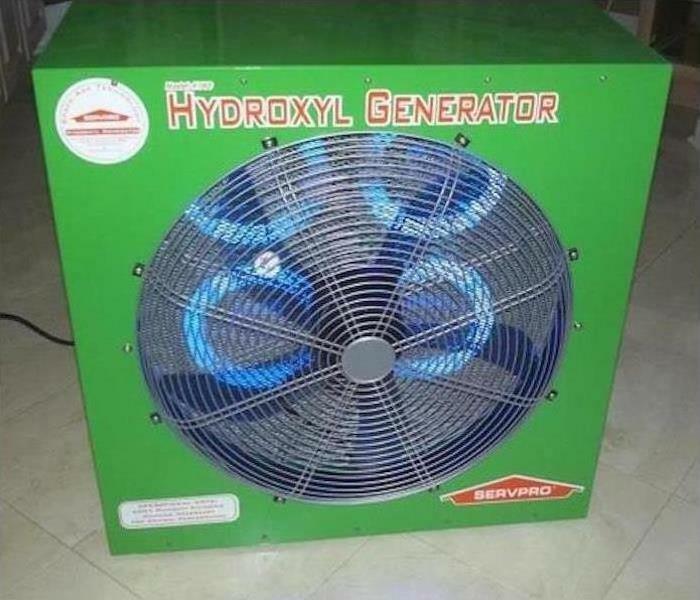 Pictured here is a hydroxyl generator which can help reduce smoke odor. Occupants of the home or business affected can remain in their properties since the hydroxyl generator does not use ozone. Does Your Hanover Park Home Have Mold Damage? Our technicians responded to a water damage incident at a home in West Chicago. We used detection equipment such as moisture sensors, moisture meters, and thermohygrometers. This equipment is used to locate the areas affected by water, define the extent to which the structure has absorbed moisture, and verify that an area is completely dry. We completed the restoration process, and the home is restored to pre-damage condition. When it comes to flood damage timing is crucial. Our team at SERVPRO provides 24-hour emergency service so that we can respond quickly to your call. Our staff has the equipment, expertise, and training to assist you. 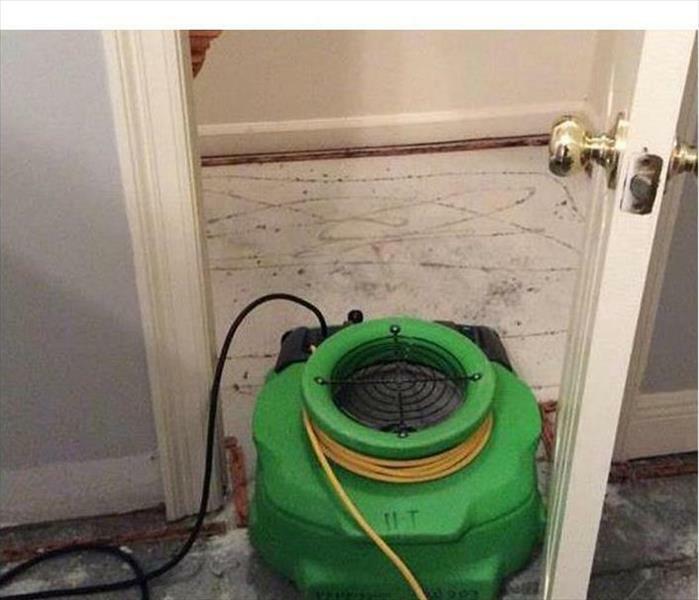 If you ever experience flooding call the professionals at SERVPRO immediately! 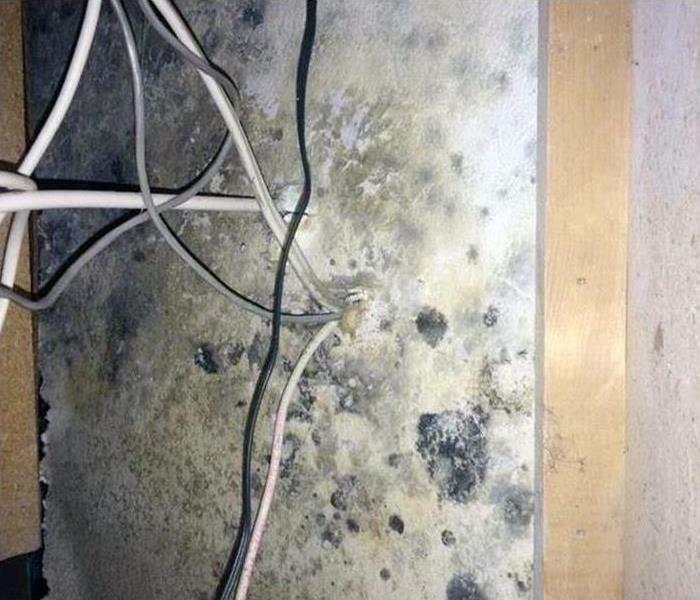 The mold infestation on the wall in a Carol Stream home was caused by a leak inside the wall. SERVPRO AMRT crew members removed the non-salvageable wall covering and sprayed an antifungal agent to prevent mold spores from developing into future patches. Count on us to remediate any mold issue in your home. A group of our damage restoration team members is pictured participating in a webinar. 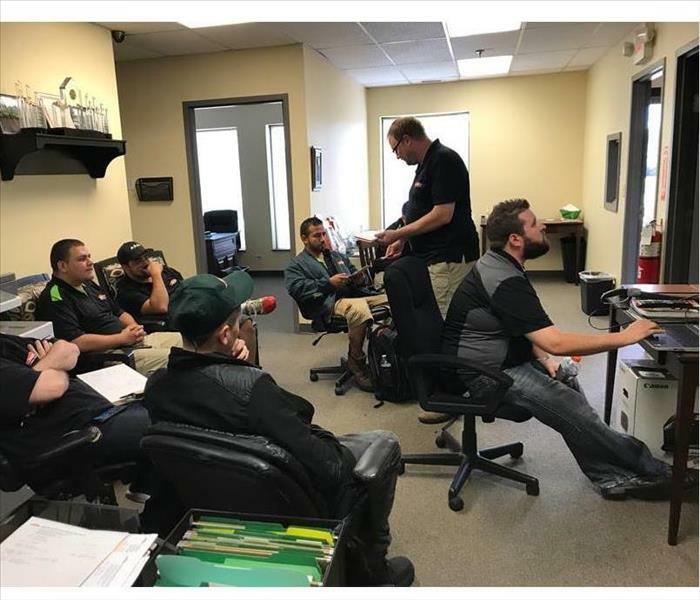 Structured training and fortification of learning modules by testing and reviews prepare our crews to provide our customers with the best in job knowledge and execution. By using current best practices, e-learning, and strong corporate support, we can meet and beat our clients' expectations. We proudly present the best in resources, both human and equipment, when we pull up to a property. The leak from the attic in this Lombard residence lifted the latex paint from the shown wall. 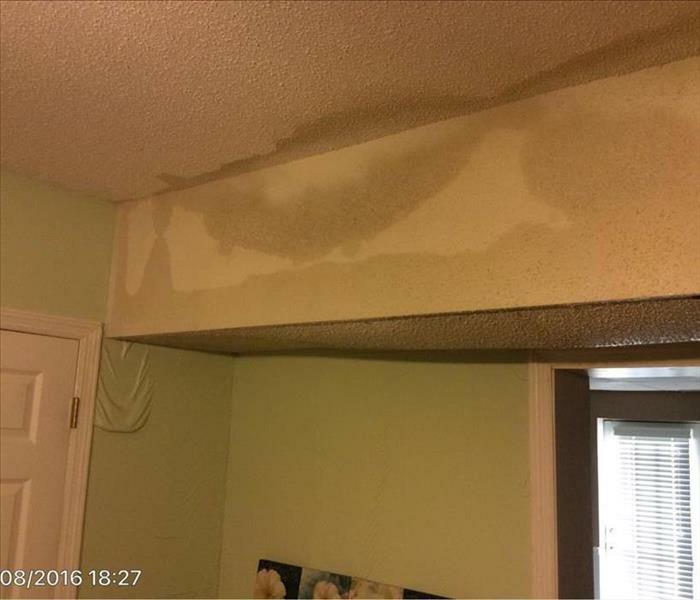 This type of water damage is common. After repairing the water line, the coating can be peeled off, the drywall dried in this case and restored and repainted by our SERVPRO crew. The poly sheeting isolates this water damaged room from the remainder of this house in West Chicago. This reduces the volume of moisture filled air to be treated by the LGR low grain refrigerant dehumidifier. This piece of equipment can extract up to 20 gallons of water per day from water affected air, building elements, and furniture. SERVPRO provides a state of the art inventory to serve our customers best. 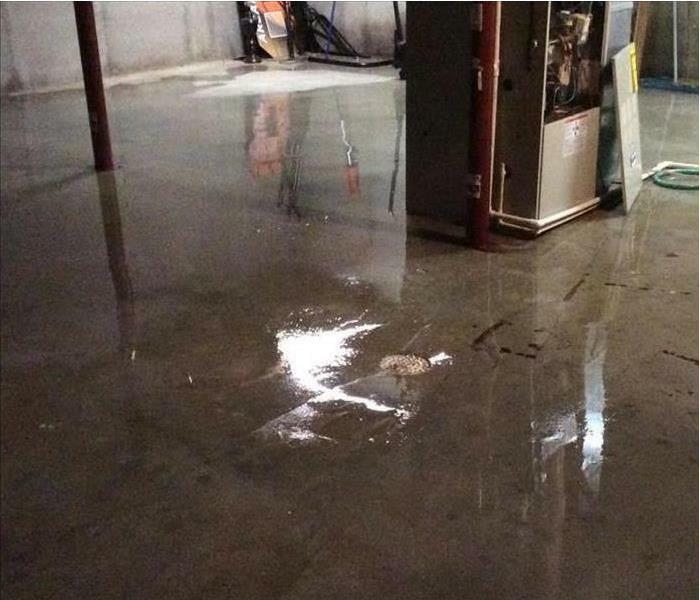 SERVPRO quickly arrived to remove the standing water on this concrete basement floor in Lombard. 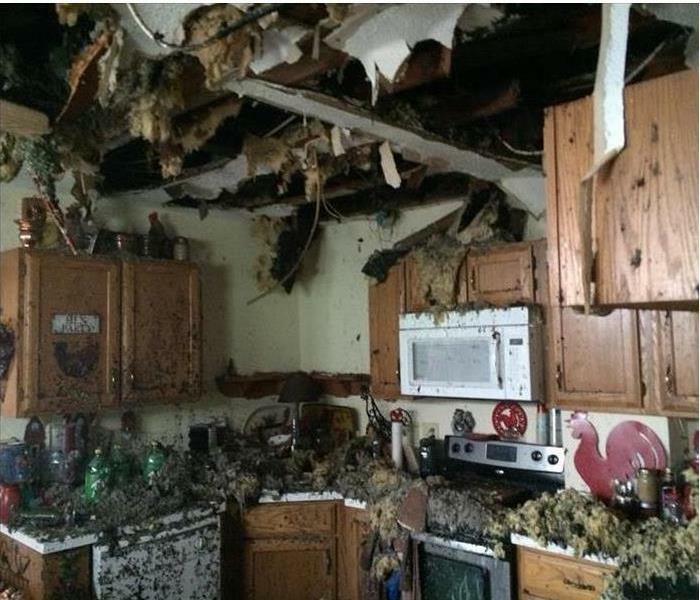 The storm spilled sufficient water for the homeowner to realize that fast action would mitigate damage to his furnace and walls. We're Faster To Any Size Disaster. The flooded flooring in the building was relieved of the standing water in the Lombard building. The "tented" surface reduced the drying volume to expedite the process to completion. SERVPRO deploys industrial grade equipment with proven methodologies which have earned the trust of our clients. 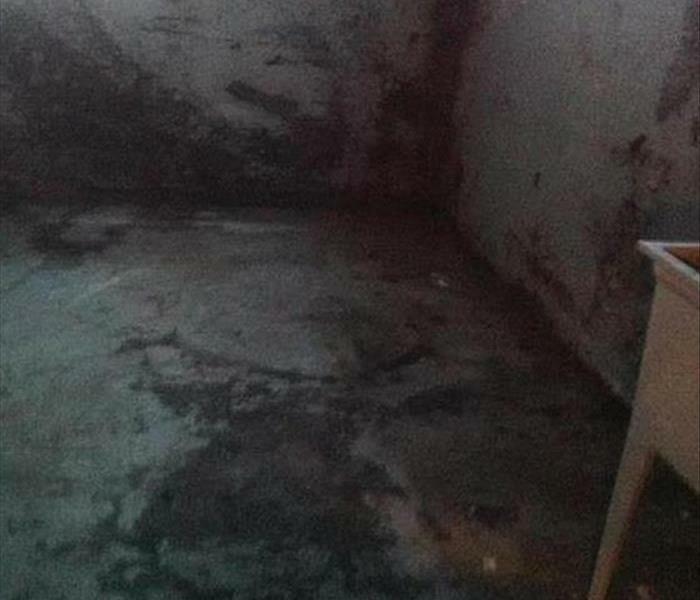 Poor ventilation and water seepage can lead to a build-up of mold colonies in an East Bloomingdale basement. Ideally, the affected area should be isolated from the upper level before physically removing the mold from the walls and floor. The source of the water intrusion must also be addressed. SERVPRO recommends placing a small, portable dehumidifier to maintain an RH of between 40-55 percent. 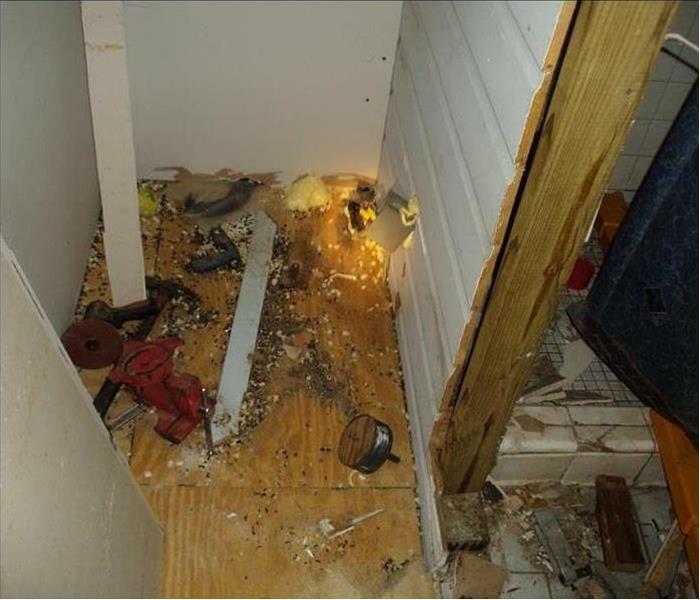 An electrical short started a fire in the attic of this Addison home resulting in the mess illustrated in this photo. 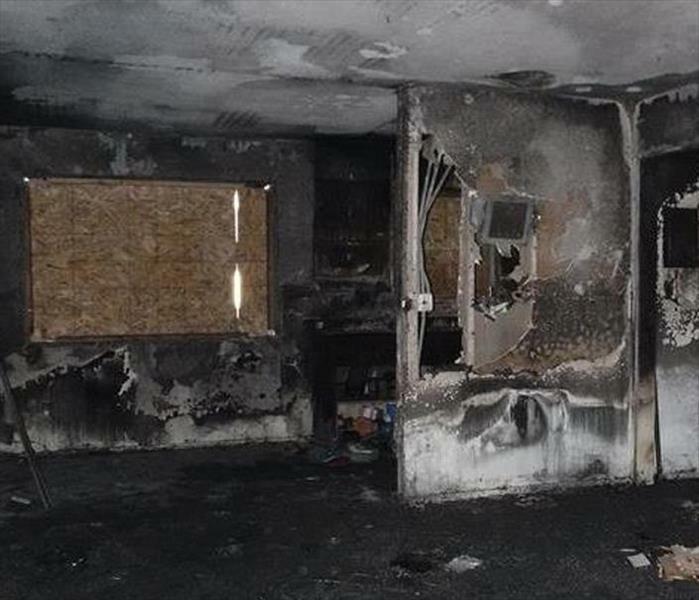 SERVPRO skilled technicians can safely clean up and discard the burnt elements of this structure. Hydroxyl generators can capture noxious smoke odors to improve the indoor air quality during the restoration service. 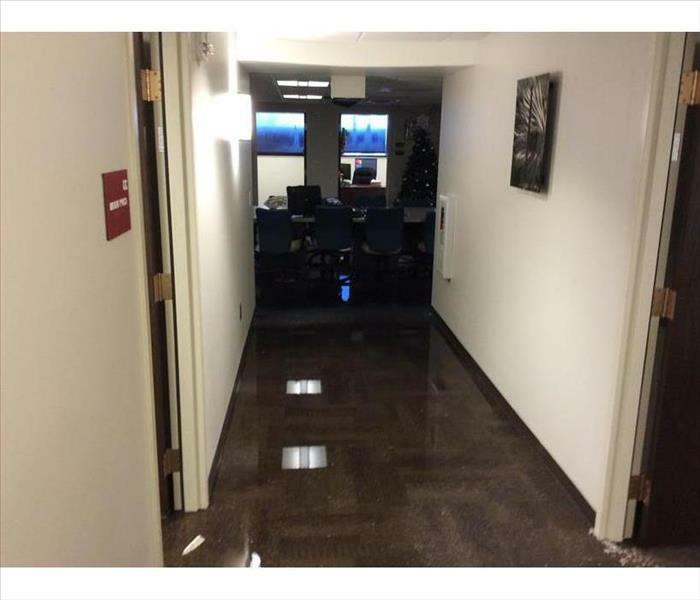 This photo depicts standing water on a commercial carpet in the hallway of this Lombard office building. The standing water can be quickly suctioned up to start the drying process. But, lingering humidity must be dealt with to mitigate secondary water damage to the electronic equipment and physical files. Call SERVPRO for swift help. Our warehouse stays stocked and ready to make sure we are prepared to help your home or business at any time there is a fire, water, or mold damage emergency. Here at SERVPRO our customer satisfaction is our top priority and making sure that every customer has a top of the line experience begins with our employees. 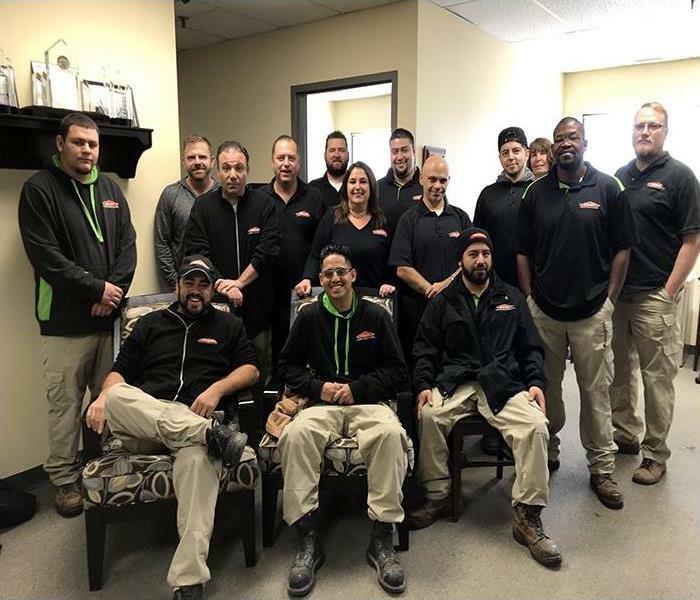 Our diverse staff is relatable, kind, and hardworking ensuring that our customers feel confident in choosing SERVPRO for their projects. It's a beautiful day here at SERVPRO of Carol Stream / East Bloomingdale and our trucks are standing by to offer you quick, professional, and thorough assistance for whatever your project may be! 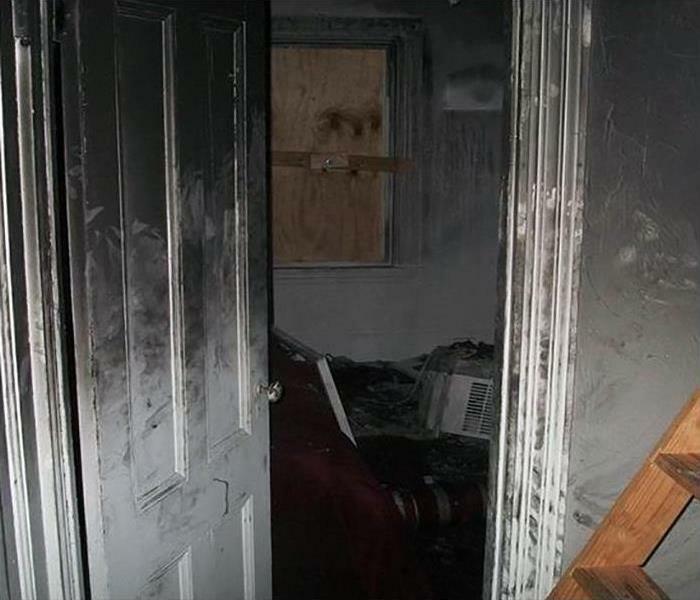 Nothing is more detrimental than fire, water, or mold damage to your personal items. Here at SERVPRO we understand how important your personal belongings are to you and your family. When we enter your home or business we box up all your items and take them to our secure climate controlled facility. From here, we use a combination of power and hand cleaning techniques to restore your items to their original condition. Our team will then store your belongings until the job is finished and everything can be returned to your home where it belongs.